Palermo Soho Rental in Buenos Aires at Thames & Cordoba Ave. 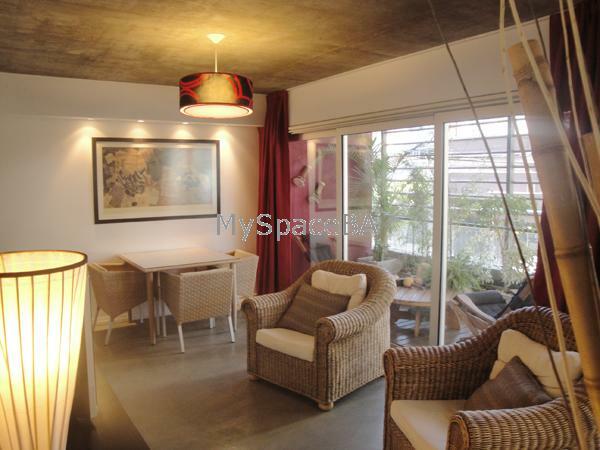 This spectacular one large room apartment is located in Palermo Soho, one of Buenos Aires most interesting neighborhoods. The apartment has one large room, full of natural ligh . Lovely balcony with deck and perfect place to take a rest . It was recently decorated with an asian theme, creating a warm and relaxing atmosphere. It has a queen-size bed and closet. A living area with two very comfortable armchairs and a dinning area with table and seat for three. There is a fully equipped kitchen and a complete bahtroom with Jacuzzi tub and shower. TV with cable. Stereo System. Landline telephone with answer machine. Air con hot/cold. Safe box. Internet. Wi Fi. Kitchen with freezer, refrigerator, microwave, toaster, coffe-maker. Dishes, Kitchen utesils. Iron. Hair dryer. Towels and bed linens. Located in Palermo Soho, you are in one of Buenos Aires’ most interesting neighborhoods. it is also filled with great shopping, sidewalk cafes and tempting restaurants. Here, you are also just a few blocks from Plaza Serrano. Included: Utilities, telephone, building taxes, and TV cable are paid by owner.